To transform the harbor and estuaries to meet the changing demands of the coming decades and to offer a richer and more ecologically integrated urban environment will require planning approaches that employ various strategies and support interventions at multiple scales. Ecological enhancement should be incremental and opportunistic, allowing for the testing of ideas and the development of different localized landscapes. Site-specific project developments will allow for the verification of adaptability, efficiency, and performance for each type of proposed ecological system improvements. The overall direction should be towards creating more articulated edge conditions, more diverse biological zones and improved habitats. Increased ecological complexity and the potential for biological systems to thrive can also provide the benefits of ecological servicing: storm surge protection, natural water filtration, stream flow stabilization and increased recreational, cultural and economic opportunities. Terraced tidal ats at sea walls, upland ecological restoration and floating wetlands in tidal shallows provide three strategies which propose to incrementally re-introduce fragments of the historic system within the grid of existing infrastructure. This Ecological restoration strategy calls for the reprogramming of some sections of the hardened shorelines. The continuous seawalls that once provided for deep-water berths along much of the harbor have largely outlived their maritime industrial usefulness. These stone and concrete structures created a simplified edge condition where water and land have no inter-action, eliminating the critical near shore habitats of the tidal wetlands. 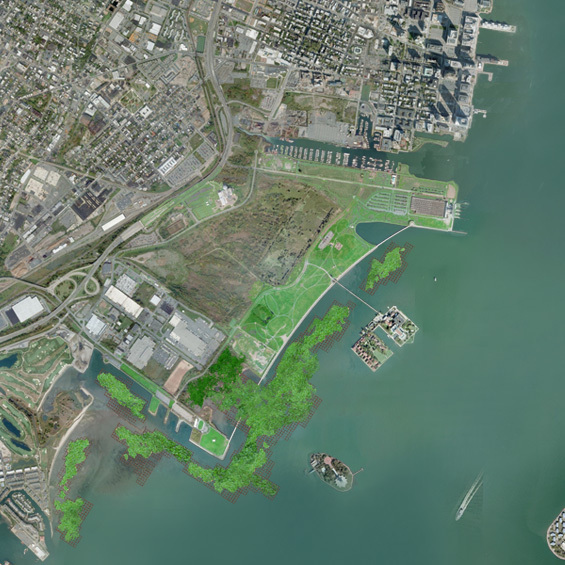 This proposed strategy involves building stepped tidal flats along sea walls that are no longer used for navigation. Critical to wetland ecology is the diverse plant life that takes root therein. Most of these species are characteristically able to thrive under the fluctuating salinity, water cycles and sediment deposits of the wetland. 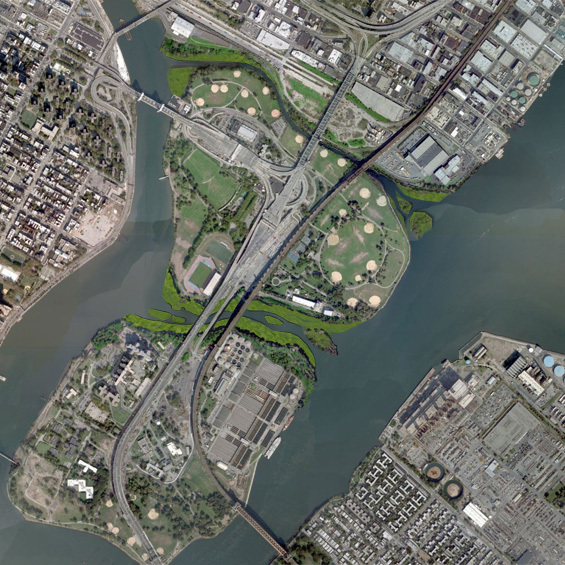 This tiered proposal in the Lower Hudson River would attempt to introduce more robust wetland species such as eelgrass, which can thrive in the particular water cycle and climactic conditions of this location. This process necessitates experimentation, site-specific phasing and close observation in order establish a sustaining ecosystem. Strategies for upland ecological restoration propose to incrementally re-introduce fragments of the historic network of water-based natural systems within the grid of the existing infrastructure. 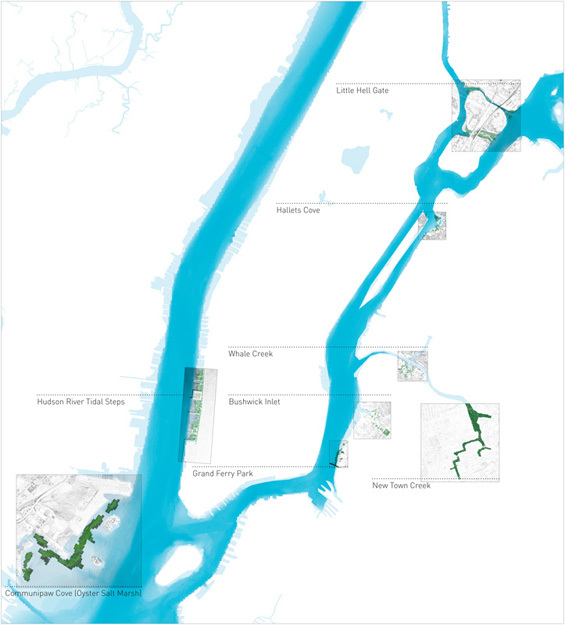 The near shore drainages of the New York harbor have endured the radical transformations that urban development, shipping and waterfront industries have imposed. Tranquil water features once occupied places like the Bushwick Creek, Newtown Creek and Hallet’s Cove, all places where water met land at an indeterminate edge. 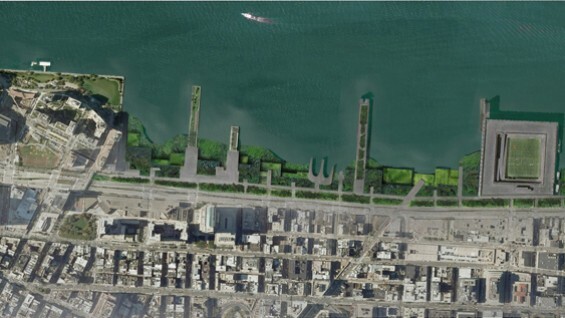 By cutting into the modern map of the city, lost indications of natural land and water forms could establish new possibilities for open space and urban ecosystems systems. Upland development should also consider the filling of water assets that are deemed undesirable and not worth the commitment of scarce environmental funding resources. 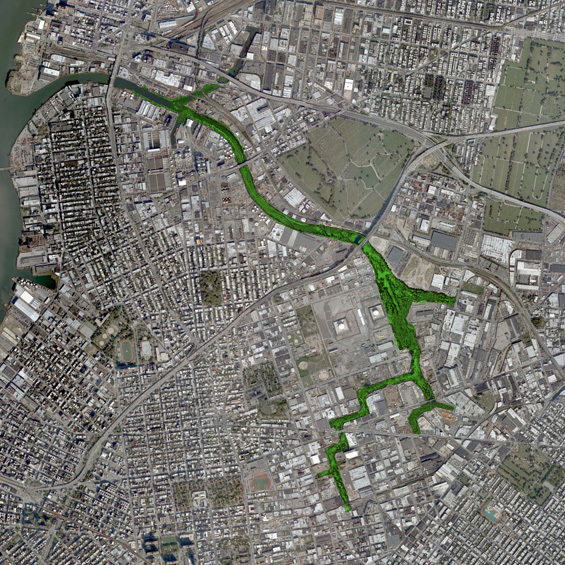 The upper reaches of the Newtown Creek and the English kills are a Superfund site that is best remediated, filled and converted to green space. The toxic legacy and the limited exchange of water leave a stagnant basin that offers little hope as a beneficial, water-based environment. The floating bio-mat proposal envisions a 21st century version of the ancient Mesoamerican Chinampa method of agricultural floating islands. Protected tidal shallow areas outside the areas dredged for navigation Upland development should also consider the filling of water assets that are deemed undesirable and not worth the commitment of scarce environmental funding resources. 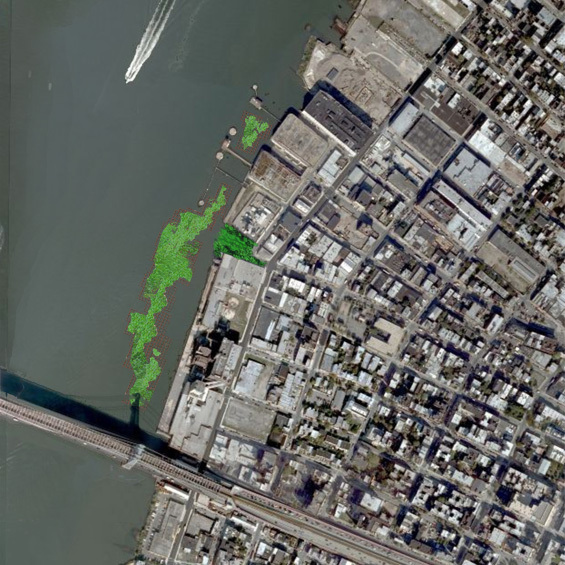 The upper reaches of the Newtown Creek and the English kills are a Superfund site that is best remediated, filled and converted to green space. The toxic legacy and the limited exchange of water leave a stagnant basin that offers little hope as a beneficial, water-based environment. One critical plant species to the proposed bio-mat is eelgrass, an underwater plant able to tolerate brackish water and multiply in various substrates and moderate range of lighting conditions. Eelgrass functions to reduce erosion, stabilize sediment and remove nitrogen.